Yesterday I got the first 2 copies of this Busteed / Ferguson of Atholhouse book printed. Here is how it starts : and it sells for $35..Plus $8.15 for postage if you live outside the area. I was fortunate enough to have been loaned, Mr. William “Bill” Busteed’s enormous collection of family documents, to scan, which I am forever thankful for. These documents contain Busteed family members’ letters, photos and misc., documents. Many letters written by Ferguson family members, from Athol House and other documents related to the Ferguson family such as invoices from the Ferguson store. The collection also contains letters from outside the area written by Ferguson or Busteed family members giving information about the living conditions of the Fergusons, the Busteeds, the Botsfords, the Armstrongs, Jelletts, Frasers and many other related families and friends. 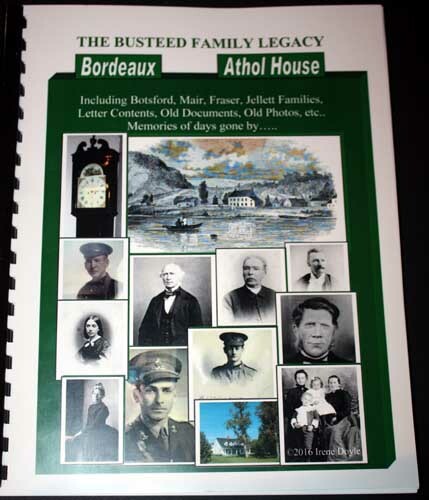 It is more than family history, its Restigouche and area history, including the Quebec side of the river. It can be purchased from me for now, if interested a cheque can be sent to me after sending me an email for my address or e-transfer can be sent through my email snobunting@hotmail.com ..